Rhapsody has designed a brand repositioning strategy for The Finishing Touch, which has significantly bolstered its mail order sales in the first few weeks since the launch of the new catalogue. 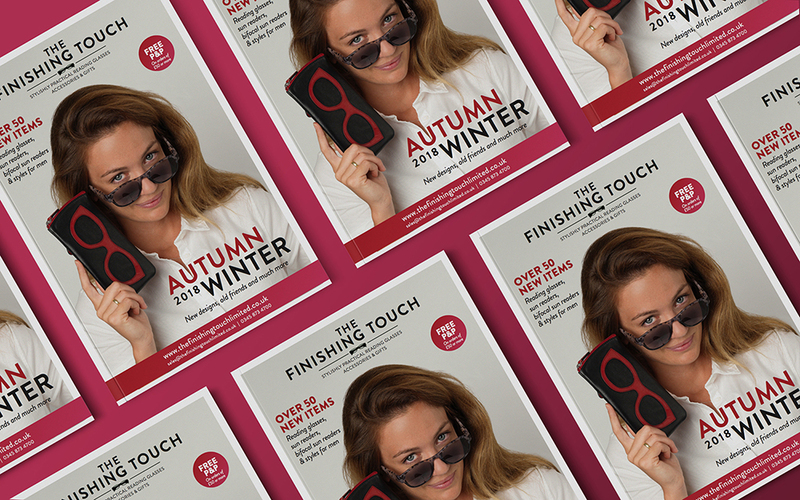 The Finishing Touch sells stylish, practical reading glasses, accessories and gifts through its mail order catalogue and website. They wanted to open up the brand to appeal to a younger target market and came to Rhapsody to develop a new brand strategy, starting with the redesign of the mail order catalogue. Our design team came up with the creative concept of using lighter, fresher colours, and modern typography, designing the page layouts as conceptual spreads featuring the range of eyewear and accessories. We also suggested showing real-life models wearing the glasses to help The Finishing Touch resonate with a younger target audience. We sourced the models and then art-directed the photo-shoot at our London studios including managing make up, hair and styling. Following the photo shoot, our in-house creative production team set about individually colour correcting and retouching the final shots that would be used in the catalogue. The Finishing Touch team were able to view all the pages online via the eMagine production system including the ability to make comments and mark-up pages through to approving proofs. Final pre-flighted PDF’s were automatically sent through to their printer using eMagine. The autumn winter catalogue was mailed out to The Finishing Touch’s database of prospects and customers in early October and founder Sue Harris has been delighted with the results.